S. and style arms blue purple; F. slightly darker blue purple, bold golden yellow signal. Voodoo Song X unknown. 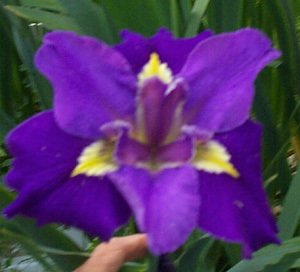 2007 Introduction 32" M bicolor Lavender and yellow. 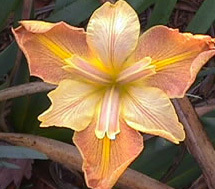 edged yellow. 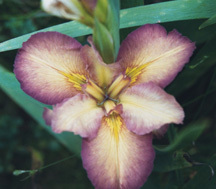 KIRK STRAWN (Bertinot, N. R93) 42" E Stands lilac purple; dark red-purple style arms; falls ruby red, yellow signal. Kristin (Dunn, M. R 84) 36" M 36" Wine rose, deeper round yellow green signal. 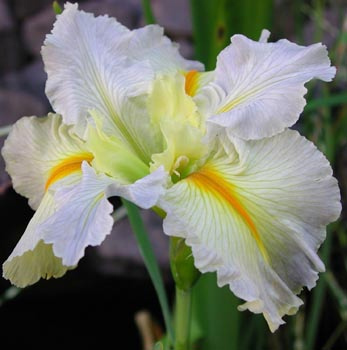 (Queen O’ Queens x Mrs. Ira Nelson)X Sidoux LeJeune Great garden iris. Kristin Nicholas (Albers, Don R 07)28" (71 cm), M.